The Durham slug or Iberian slug is a good example, how difficult it may be sometimes to give the correct name to gastropod species and that sometimes it is even more difficult to put right errors made a long time ago, especially if the species is quite well known. On the present homepage the Cornu Problem has already been described: The brown garden snail is generally known under the name Helix aspersa. Actually the name Helix aspersa is incorrect, because from the construction of the genital apparatus, it can be seen, that this species is not a member of the Helix genus. For that reason the species had to have a new name, and indeed it had been described by Ignaz von Born in his 1774 description of the Vienna Natural History Museum collections (Index rerum naturalium Musei Caesarei Vindobonensis). But von Born had used a misshapen (teratological) specimen shell, which is why the genus was called Cornu - the horn, as the snail's shell was shaped like one. Like in colloquial texts the Name Helix aspersa will not disappear, in malacological circles, the scientific term Cornu aspersum is maintained, though there is probably a more correct one in Cantareus aspersus (Charpentier 1837). The situation is a bit different concerning the Spanish slug, which is one of the most notorious agricultural pests and therefore also one of the best known gastropod species there are: In 1956 the invasive species was determined as Arion lusitanicus (van Regteren Altena 1956). But that was a false determination, so the species known and feared as the Spanish slug in all of Europe, is not Arion lusitanicus. Arion lusitanicus, for that matter, is known from the Iberian peninsula, an endemic species from the Serra d'Arribada (near Lisbon in Portugal), which only occurs there. 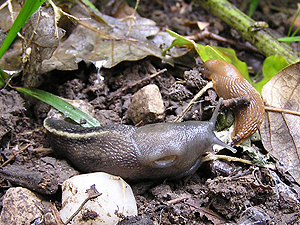 Since then, the invasive Spanish slug has received an existing, but unused name, Arion vulgaris Mabille 1855, which translates as the common slug. The real Arion lusitanicus is quite different from Arion vulgaris, known as the Spanish slug, by its chromosome number: Arion vulgaris has 26 of those, a number it has in common with the domestic species of Arion - the black slug (Arion ater) and the red slug (Arion rufus). Arion lusitanicus only has 24 chromosomes. However, both species have in common that they lay very many eggs (part of the Spanish slug's recipe of success is to lay up to 400 eggs a batch, in which it surpasses the other Arion slugs by far) and that they produce a special kind of slime. This, according to Ørmen, T.; Winter, B.; Bøckman, P. (2009) should be an adaptation to the dry climate in their original home area - Arion vulgaris, too, originally comes from the Iberian peninsula and from Western France, from where it began to spread and invade other countries since the middle of the 20th century. A final remark concerning the present homepage: Originally the name Arion lusitanicus was supposed to be kept in continuous use, so that search engines would find the texts. On the other hand, the subject has to be presented in a manner as correct as the author is capable, which is why the homepage now (20.05.2011) is changed to Arion vulgaris. Hopefully the present text will help to clear things up. Ørmen, T.; Winter, B.; Bøckman, P. (2009): En eksperimentell studie av territorial- og predasjonsadferd hos stor kjølsnegl Limax maximus. Fauna 62(4) 2009: 106-111. (An experimental study of territorial and predation behaviour in the grey slug Limax maximus). Animal Base: Arion lusitanicus species taxon summary. Animal Base: Arion vulgaris species homepage. The Invasion of the Lusitanian Slug. 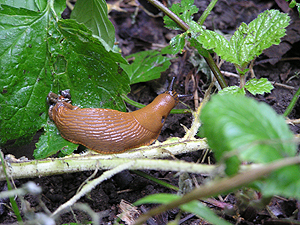 Slugs and the Variety of Food Sources. Nordsieck, R. (2008): "Arion vulgaris MOQUIN-TANDON 1855 – der "Meister der wirksamen Ausbreitung" auf dem Weg zur Raubschnecke? ": Mitt. D. Malak. Ges. (79/80), p. 49 - 51.